Parts of the so-called ‘smart factory’ are already reality, and many processes and functions between information and operations spheres are becoming increasingly coordinated. 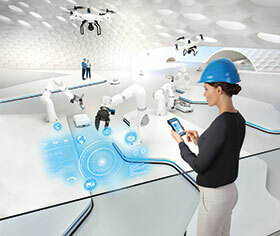 At the centre of implementing Industry 4.0 is the requirement for intelligent and communication-enabled sensors to provide the smart factory with the data it needs. A communicating, intelligent sensor network, where sensor data is exchanged with a machine controller, or a cloud-based application, allows automatic adaptation of process parameters to new production orders within seconds. That means increased agility and better process efficiency across the enterprise. ‘Sensor Intelligence’ has been at the core of the SICK brand since 2004, manufacturing sensors that are best in their detection class. They also support the communication standard IO-Link, in whose development SICK played a major role. They become smart through wide-ranging potential for self and process diagnosis, and through integrated logic functions for processing signals directly at the sensor itself. However, what, in concrete terms, does intelligence through diagnostic capabilities and integrated functions mean in the context of the smart factory? Smart photoelectric sensors, for example, can detect patterns in an object structure and any changes in them. This takes place directly and autonomously in the sensor – not in the PLC. Machine processes are therefore accelerated and the control program streamlined. This means greater plant efficiency and lower costs for customers. The wide-ranging diagnostic functions of smart sensors can detect critical situations, and correct them, promptly, before the machine experiences an unplanned stoppage. This increases operating reliability, and thus the productivity of the entire plant. An example of the ­benefit of upgrading to smart sensors can be seen in the case of inductive devices. The SICK portfolio includes a range of inductive smart sensors that, for example, detect the distance between the object and the sensor. They can detect when machine processes deviate from the target state and provide a warning in good time, or even make autonomous statements regarding product quality. Ultimately consumers also profit from intelligent sensors and dynamic interactive production processes. The key term is batch size 1. Many people are searching for ways to express their individuality. They want to have products that are perfectly adapted to their individual needs. Such true one-offs are either impossible or very expensive using classic production structures. This is where smart sensors can open up new innovation potential. Furniture, for example, can nowadays be configured on the Internet. Dimensions, design elements, the type of wood and colours can be freely selected, combined, and ordered. The customer order reaches the production system and the machines via the network. The machines are equipped with intelligent sensors that the controller can parameterise appropriately for the particular product, so that the desired piece of furniture can be produced automatically. Production, inspection, packaging and dispatch all take place according to that individual order – and without any manual interventions. The customer receives their personal one-off piece at the price of a mass-produced item. This, however, is by no means the limit of the potential of smart sensors. Structures that are more autonomous; plants and factories with greater networking; production (and products) that involve more software and IT – all this can already be seen, and makes smart sensors a critical technology of future production processes. Flexibility will therefore be in greater demand in future. Highly individualised requirements will mean manufacturers have to be able to react rapidly and precisely to each specific requirement. This will lead to a continuing demand for new functionality in sensors that will keep getting smarter.